It might start with an elevated heart rate. Then you can’t catch your breath. It feels like you’re looking at your life through thick, foggy lenses. You can’t stop the wave of panic. Then it subsides and you wonder when it will return. You start waiting for the other shoe to drop. You don’t want to do anything for fear of triggering those feelings again and you think you might never return to a normal life. At the prospect of never feeling just “ok” you start to feel low. You disconnect from family and friends and you can’t get motivated to do anything. This is the cycle and anxiety and depression and I’m far more familiar with it than I’d like. If you’re one of several million Americans who suffer from these symptoms you’re not alone and you need to speak out and seek healing. When people talk about physical disease, there’s an understanding that it’s a normal part of life. People get sick, and many people have chronic diseases that limit their diet, or may occasionally cause them to stay home when they have a flare up. But thanks to Hollywood when people hear the words ‘mentally ill’ they often picture a deranged psychopath or some dangerous doctor Jekyll/Mr Hyde type. In reality mental illness is a relatively normal part of life, just like physical illnesses. And, just like physical illnesses, mental illness can have a variety of causes. Some people think mental health is only determined by life experience and genetics, when in reality, your mental health can be hugely influenced by diet and exercise, viral diseases and even bacterial infections. 26% of Americans are dealing with some kind of mental illness right now. I say ‘right now’ because not all mental illnesses are life-long, many last a few years and some last shorter than that. In 2013 there were over 41,000 suicides in the US making it the 10th most common cause of death in the US. 20% of Americans will get the Flu this year and on average it causes fewer annual deaths than suicide (36,000 compared to 40,000), and yet we spend more time talking about, avoiding, and treating the Flu. We need to think of it like a physical disease – like asthma or bad allergies. Because it is; mental disorders are combination of factors, but persistent anxiety and depression disorders have many causes that are more closely linked to physical health. 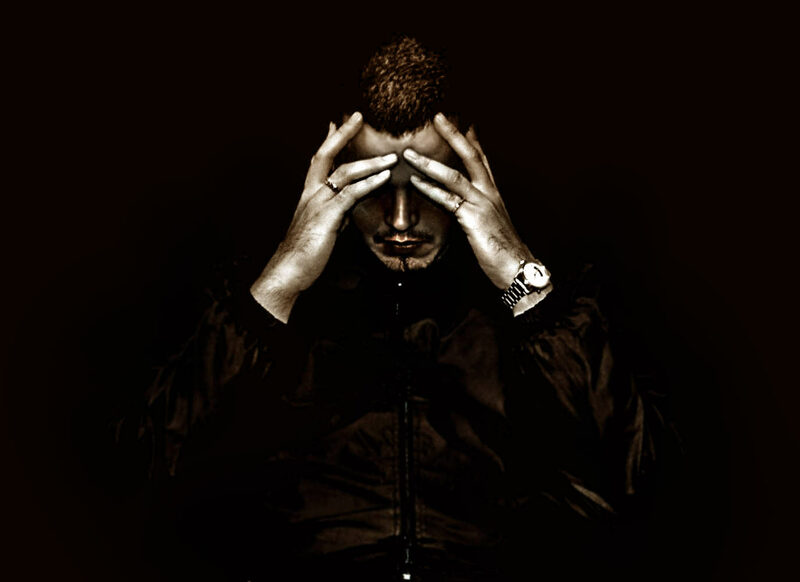 As long as we’re seeing depression as a mysterious ‘boogy-man’ disease we can’t treat it. Just like a cold, allergies, asthma, or the flu, a person suffering from an anxiety or depression disorder can’t help it. They don’t always know what’s causing it, they can’t choose when it happens and they can’t just “snap out of it.” The worst forms of anxiety and depression don’t have any obvious triggers. No reasonable person would tell a diabetic (a condition that can be caused by diet or by genetics) to not take their medication. Nor would anyone say that by taking medication an asthmatic not following God’s will. The medication used by anxiety and depression sufferers has saved many lives, and while it’s not always a long-term solution, it gets people to a place where they can think clearly enough to address their issues. Treating it like a physical disease doesn’t de-spiritualize it, nor should it remove all responsibility from the sufferer. I think people in the church believe that if we call someone’s struggle with depression an “illness” that we’re somehow excusing it, or we’re saying that the person cannot do anything about it and therefore is absolved of responsibility. If a person has the flu, do we still not pray for God’s healing? We still treat physical diseases as if they had a spiritual element. By the same token, if someone doesn’t get a flu shot, doesn’t take care of themselves, doesn’t wear a jacket in the cold, misses sleep, and doesn’t eat healthy – would we be surprised if they got the flu? Their immune system in compromised and it was their fault. In the same way people can do things that put themselves in an unhealthy mental state, and yes it is their fault and they need to realize that. Once someone has the flu, do we say it’ll just pass and tell them to get back to work? No, they need to go see the doctor, rest, and take meds. Visiting a doctor, seeking treatment, taking medication – these don’t remove the spiritual element from illness. The first step in dealing with depression or anxiety is understanding where it comes from. If you can determine a likely cause then you’re more likely to be able to find an effective treatment. Having said this, most will have an issue caused by one factor and exacerbated by other factors, as such it is good to examine each area and consider lifestyle changes that will put you on a track toward spiritual, emotional, and physical health all at once as it can’t hurt anything to get better. In Matthew 8, Luke 8, and Mark 5 we have an example of one of the few passages to occur in all three of the synoptic Gospels; Jesus casting the demons out of the man called “legion.” Obviously this is a dramatic example, but the fact that all three Gospel writers wanted to include it goes toward the fact that they saw the need for hope and healing in a world where many people were probably struggling with lesser demons. Note that according to scripture demons can cause physical illness as well – so if you want to victim blame Christians for being mentally ill because it “must be” caused by demons, you have to apply the same logic for anyone suffering from a physical illness as well. The good news is that Christians have authority to cast demons out. Sounds crazy but its true. Luke talks about this a lot in his gospel, which is interesting because he was a physician, and likely saw the link between the spiritual and the physical. Being far from God is another cause of depression and anxiety. I hesitate to say this one because this is the most misused cause, but it is a cause. For some reason, with all the many different potential causes this is the only one some Christians pick out. While being far from God is a cause of depression, I haven’t met many Christians for whom this was the cause. Many Christians struggle with anxiety and depression despite being active in a church, engaged in prayer, plugged into a small group, and reading scripture. If you haven’t ever struggled with a mental illness be careful about the way you assume it works. This is the most obvious one to most people, but also the one that can take the longest to untangle if left untreated. It’s normal to experience depression and anxiety if something happens in your life that makes you depressed or anxious, but if you don’t deal with those normal emotions in a healthy way, you may be setting yourself up for more depression and anxiety later on. Most of us are terrible at being honest with ourselves about what is causing our depression and anxiety and yes, there are often deep-seeded causes from our childhood that may need to be discussed. It is also normal to feel depressed or anxious if you’re not living in community with people, or if you’re having trouble connecting with friends, or family. Sometimes the emotional cause has to do with personal goals and life focus, and while it isn’t the only cause, being exclusively focused on yourself is almost a guaranteed recipe for depression and anxiety, this can lead to a frustrating spiral effect; you think about yourself and you get depressed, you think about your depression and wonder if things will ever change and you get more depressed and anxious. Throw in a little guilt for feeling so self-focused and you’re a prefect, self-sustaining storm of angst. I want to emphasize that I’m not talking about normal emotions that occur in the immediate wake of tragedy, or because of a specific circumstance to which the normal response would be depression. Getting upset about bad things is a healthy emotional response. However, if after the upsetting circumstance has passed, or if you are still finding yourself having trouble coping with a loss even years later, that is likely a sign that you need to treat it as an illness. We now know better than ever that many common mental illnesses can be glitches be in our DNA passed from parent to child. This isn’t any different from genetic causes for heart disease, high blood pressure, cancer, and auto-immune diseases. But just like with those diseases there are ways to curb risks and be proactive about dealing with your predisposition. This also does not mean that sufferers have to be victimized by their biology. “I was born this way” has never been ok with God because thanks to Adam, we’re born sinful, and God has given you the power to over come your flesh through the Holy spirit. There are many different physical causes of mental illness that doctors are only just now beginning to understand. Really anything that can cause you physical illness can cause or contribute to mental illness. Viruses, Bacteria, Physical trauma, Diet & gut flora, (lots of research supporting this now) and a sedentary lifestyle can all contribute to your mental state. Too often we don’t account for the fact that being obese, being sedentary, eating unhealthy foods, and even just getting sick can have a profound impact on the way your brain is functioning and lead to systemic problems in our regular thought patterns that, if unaddressed, lead to worse and worse things. It should be liberating, and very encouraging to know that there are many effective ways to treat mental illness. And while most treatment takes time, making a plan to fight back can be in and of itself a therapeutic act. While most mental illnesses have a variety of factors, its important to understand how to treat them based on their cause that way you can form a plan of attack and begin to be proactive. Think of it like the the fable of the bird that chipped away at the mountain by pecking his beak at it, only each time you return the bird gets a little bigger and a little stronger. Reading scripture – Today in Frazer’s contemporary worship service Emily Roach talked about a doctor who encouraged her to read scripture as a part of her mental health regimen. Reading a Psalm a day is an example of a simple prescription for spiritual peace. And having a readular scripture and prayer quiet time will help you be sure that you’re not feeling depressed simply because you’re far from God. So if you’re not serving you’re actually being disobedient. Matthew five has Jesus’ sermon on the mount, probably the most well-known part of this is the beatitudes. They’re the ones that all start with “blessed are the…” which is another way of saying “happy are the…” Just read those and do them – I don’t want to copy and paste them all here and make this entry even longer – so I’m going to ask you to just go and read your Bible. Counseling – Counseling isn’t for ‘crazy people’ any more than marriage counseling is for bad marriages, or going to the doctor is for people who don’t take care of themselves. Anyone can benefit from going to a counselor. And just like physical therapy, it can take several sessions to feel the benefits. The greatest benefit of a counselor (and the reason that counseling is the best treatment in all circumstances) is the fact that they’re an objective observer who can help you develop a plan for fighting your depression. Keep in mind that finding a good counselor can take time, don’t give up if you don’t click with the first one you visit. This might be the most important step you can take, so take the time to make it happen. Counseling isn’t free, but it’s worth it. Expressing it to close friends and family who know you well – try to explain your feelings to your family, guys this is especially difficult and you don’t have to take forever and draw it out. It might just be as simple as saying to your wife “I really miss my dad tonight” or calling a friend up and saying “I saw something that happened on TV that reminded me of the car crash.” Or simply admitting “Work really has me feeling down today” You don’t have to analyze it; you don’t have to draw it out, just talk about it. The more you talk about it the easier it is to deal with it. And you also gain allies who can help you through things. If you currently don’t have any friends then visit a few churches in your area until you find some. Also, try not to dump your issues out on the table the first time you meet them – wade in slowly. Exposure therapy – when trauma happens in our life the natural tendency is to shield ourselves from anything that reminds us of it. This often makes things worse as it can eventually cause a person to withdraw from everything: work, relationships, and church. As hard as it is, it is just common wisdom that little by little you have to be willing to expose yourself more and more to things that may trigger depression or anxiety. This, coupled with counseling and the support of allies who know your struggles, is an important part of overcoming trauma. You may even consider working up to sharing your own story as a goal in this. Parents who have dealt with anxiety or depression can be proactive about seeing the signs of it in their children and teaching them early on about how to manage it so they might be able to overcome it in adulthood. Don’t be afraid of medication or counseling – both can be helpful, especially when you’re being overseen by a Christian doctor. Counseling is always helpful for someone who wants to get better. At the risk of sounding like a drug commercial – talk to you doctor. Seriously. If someone in your family suffers from depression and you have symptoms of it too, it might be something to talk about with a physician or a counselor. There are counseling therapies to help change your thought patterns, just because your parents struggled with this doesn’t mean you have to also. Physical causes can be cumulative and the only way to be sure that none of them are the cause is to see to all of them; a healthy life style goes a long way to dealing with depression and anxiety. Frazer has an activities center, they’d love to help you make a lifestyle change that might help assuage symptoms. Lots of simple diet changes can contribute to a healthier mental state Google “depression/anxiety diet” to read more about it. In addition to the millions of people out there who struggle with mental illness today, many of our church leaders both past and present suffered from some form of mental illness at some point in their life. David’s psalms indicate many times that he dealt with both anxiety and depression and called out to God over it. Some believe Paul’s “thorn in the flesh” in 2nd Cor 12:7 could’ve been related to anxiety or depression – it may have even been panic attacks. Martin Luther may have struggled with depression when he was young, and wrote much about how to address depression in the church. John Wesley was very depressed in the wake of his failed missionary journey to the US and some believe he may have had some obsessive compulsive tendencies. Modern church leaders like Erwin McManus, Louie Giglio, and Carlos Whittaker have all been honest about their very real, very had struggles with mental health. Giglio was almost bed-ridden for three months due to what’s called “fear of death syndrome” about eight years ago. McManus has always been very honest about his life-long struggle with anxiety. Carlos Whitaker has a brief, honest blog entry where he confesses his own anxiety struggle. It isn’t (always) self centered – often times people assume that those who deal with anxiety and depression are simply too self focused. Certainly self centeredness can cause depression, but not all people who struggle with anxiety or depression do so because of self centeredness. Also, for a person who is struggling in the midst of also being self focused, it isn’t helpful to tell them that they’re too self-focused. They need to arrive that on their own. It’s better to assume there are other causes and focus on those to help them get to a healthy enough place to be able to see themselves. Or consider the fact that when Jesus talks about doing for the “least of these” in Matthew 25 he talks about meeting physical and emotional needs. 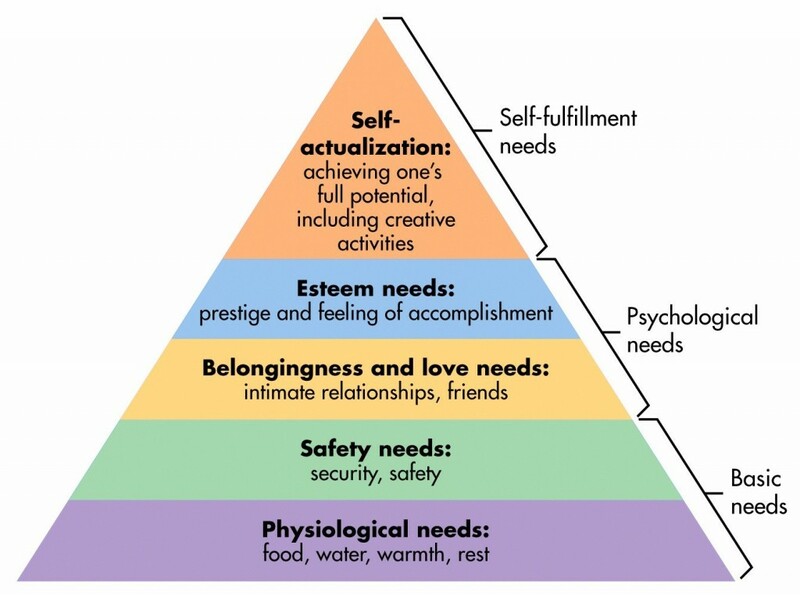 Total rabbit trail here: Psychologist Abraham Maslow identified this in 1943 when he developed what we now call “Maslow’s Hierarchy of needs” Basically it works like this: If you’re about to die because you’re sick or starving, you don’t care about your safety. If you’re worried for your safety, you’re not as concerned about your emotional needs, if you’re emotionally compromised at a deep level you’re not as concerned with being productive or being respected by your peers, if you’re not being productive or respected, you’re not going to be able to do all those wonderful things that us humans do best like think critically, be creative, overcome prejudices and accept difficult facts. – while spiritual needs exist at every level of the hierarchy of needs, we can be of more use to God the more our physical and emotional needs are taken care of. You have to decide that suicide is not an option. If you are reading this and you are and have recently found yourself considering suicide, please know that it is not the answer and my home church and I so much want to help your realize that. Do not be embarrassed; millions of people deal with suicidal thoughts. Whatever lies you may be telling yourself, know that the truth is this: The creator of the universe loves you and we here at the church want to help get you to a place where you can experience that love fully, so please let someone know if you’re struggling. Why is it so prevalent in the US? Some people point to the statistics that say that US has higher occurrence of anxiety and depression than other developed countries because of our affluence, that may be true. Keep in mind it also might be true that we are better at diagnosing it, and in some cases we may over-diagnose it. (We’re keeping children’s ADD diagnoses out of this discussion for now) Well first I would point you back to Maslow’s Hierarchy of needs, which does show us that as more of are needs are met that new needs arise. Next I would also point to the obesity epidemic and repeat; physical health is inextricably linked to mental health. And finally consider this: if Satan sees that in the US we have the most advanced medical tech and we’ve conquered most major diseases, how would he choose to attack us next? He’d attack in a way that would go unnoticed until it was too late. First off, you need to understand that if you’ve never dealt with clinical anxiety or depression you cannot understand how it feels, and knowing that will be the most helpful thing in helping us. You will need to be patient and you cannot be bothered by repetition as you may hear the same thing thousands of times and you may have to repeat the same comforting words thousands of times. “This will pass” and “this is temporary” and “you’re going to make it through this” are usually helpful if said in a loving spirit. Being told to ‘snap out of it’ isn’t as helpful as you might think. Similarly telling someone who struggles with anxiety that the object of their anxiety isn’t really an issue will only ever make things worse. Imagine if you knew that aliens were coming to kill us all, being told that it was crazy wouldn’t make you calm down either would it? You don’t have to agree with the cause of the anxiety to recognize the reality of the anxiety itself. The same goes for depression. The quicker you acknowledge the legitimacy of a person’s pain the sooner they can start on a path to healing. We, the church, want to be part of your healing. We believe that depression is a spiritual struggle and we’d to talk with you and offer counseling. We do offer counseling in our chruches, but we know that because of the stigma of mental illness for some it’s a struggle to come to a church. If you’re from Montgomery, AL where I live, I highly recommend the Samaritan counseling center here in town. I’ve enlisted their services for my own struggles. Focus on the family offers a great counselor locator to tell you where to find Christian counselors. If you don’t jive with your first counselor, don’t’ give up. It may take a few tries to find a good fit. I’d believe that I speak for all of the evangelical Christian church when I say that we all want to be a community of people who can be there for you in these times. Which is why at Frazer, the church where I work, we believe one of the greatest steps you can take for your own mental health is to join a small group. This isn’t group therapy, but it is community and having a support network is one of the best steps you can take for your emotional and spiritual health. You can find out details about small groups at Frazer here. But if you don’t live in Montgomery, I still really encourage you to seek out a church where you can be yourself and speak honestly about what’s happening in your life. It’s all connected, the physical, the mental, emotional, and the spiritual. Getting healthy in one will help you with the others. So spend time with friends, make time for cardio, meditate, eat healthy, and if you don’t know Christ as your savior I’d like to introduce you. Meet me at church this Sunday.